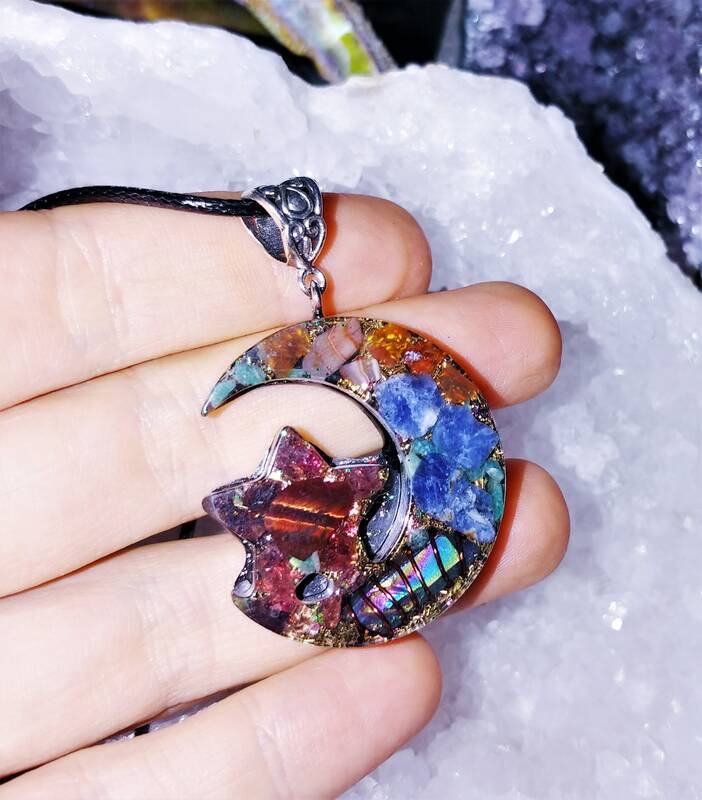 This dainty Moon Star Orgone pendant was made to aid the Throat and Heart Chakra centers. Use this pendant as a tool to align the energies of the bodily chakras and bring them into an equal alignment. You may work with the pendant consciously, or receive passive healing just from wearing it. The moon is a feminine symbol. It's phases of the moon symbolize immortality and eternity, enlightenment or the dark side of Nature herself. It might reflect inner knowledge, or the phases of man's condition on earth, since it controls the tides, the rains, the waters, and the seasons. It is the middle ground between the light of the sun and the darkness of night, and thus often represents the realm between the conscious and the unconscious. In astrology, the moon is a symbol of the soul, and in the horoscope it determines the subject's capacity for reflection and adaptation. It also provides analogy for the stages of human development: the new moon is infancy, the crescent is youth and adolescence, the full moon is maturity and pregnancy, and the waning moon represents the decline of life, sleep. A crescent shape is a symbol used to represent the lunar phase in the first quarter or last quarter moon or a symbol to represent the Moon itself. A crescent sign when the moon points are facing up is a goddess sign. Such a crescent moon symbol is often associated with Celtic culture and called Celtic crescent moon necklace. It contains Tiger's Eye, Carnelian, Amazonite, Sodalite, Garnet, Shungite powder, Pyrite sand, Rainbow Aura Quartz wrapped in copper wire, copper coils, mica, 24 k gold leaf, tesla coil, red copper coils metal shavings, Reiki healing energy, Love and Light, 528 Hz frequency. Orgone Accumulating Device is a substance which functions as a self-driven, continuously-operating, highly efficient energy transmutation device, drawing in negative life energy and transmuting it into positive energy. It is reputedly protects one from harmful EMF radiation. Some people feel increased energy and a greater sense of well being when wearing or being in the vicinity of orgone products. Orgone Device is made with metal shavings and epoxy resin. Quartz and copper are popular ingredients due to their conductive properties. The resin is poured over the quartz and metal shavings, and it shrinks as it hardens, exerting pressure on the quartz, permanently squeezing the quartz crystal inside which creates a well-known piezoelectric effect inside the crystal, meaning its end-points become polarized electrically, this apparently causes it to function more effectively as a positive energy generator. I personally consider Orgone products to be one of the most advanced Spiritual tools available today and feel that these products would be highly beneficial for anyone. Thank you! Arrived today, & it is absolutely beautiful! Love the hand written note, & the pretty packaging which also smelled heavenly!